Re-posted in excerpt from State of the Nation, please visit for full article. 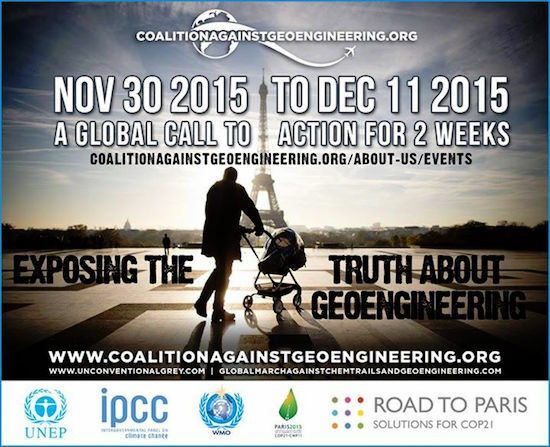 This Global call to action, covered below, brings together Geoengineering activists and calls for all concerned citizens worldwide as well to participate by keeping the focus on Geoengineering through all 12 days of this conference. Article links included in this article point to added State of the Nation reportage on Geoengineering and Chem Trails which have been loading toxins into our atmosphere now for decades, and which are being scientifically linked by many scientist and meteorologist whistleblowers to climate warming, instability, and change–but which are being ignored by the Globalists pursuing their Global Carbon Control Matrix, which they possibly hope to roll out post-summit, and which may just be prelude or shoo-in to their totalitarian vision of One World Government. Things are heating up worldwide; and our time to speak out and protest most definitely is now. If Geoengineering is a sketchy subject to you, please look it up and find out more. This Climate Summit is seeking to fully ignore Geoengineering, and it’s only concerned voices like yours and mine that can challenge and protest that approach. All eyes are now on Paris, France. Not only did the false flag terror attacks of Friday the 13th draw the attention of the whole world, the upcoming U.N. Climate Conference has likewise seized the attention of numerous anti-geoengineering groups and anti-chemtrail organizations. The meticulously engineered drama in the City of Light has somehow shifted the light of truth on the darkness of the clandestine NWO agenda. It’s quite true that many folks have awakened many to the real agenda behind the upcoming 2015 United Nations Climate Change Conference being conducted in Paris from November 30th through December 11th. Many armchair investigators have even pointed to the real reason for the attacks as a way of directing the outcome(s) of the Climate Summit. The very fact that the French Government is working triple time to ensure that the conference takes place, in spite of the intensified security fears and lingering mayhem, is quite suspect. Why would they not simply cancel or postpone this momentous climate conference? Is it because they have serious plans to execute the first major phase of a One World Government? Certainly the tenacity of those hidden forces who are will not be deterred from holding this conference is extraordinary by any standard. It’s as though they have a set schedule to put the foundation of the new Global CO2 Management Regime into place and nothing will get in their way. Of course, it does appear that the Paris terror event was specifically timed before the conference so as to create a coercive environment in which to impose their highly misguided agenda. This is where the organizers of the “Global MARCH Against Chemtrails and Geoengineering” come in. These folks have been pounding the pavement and banging the drums ever since this conference in Paris was put on the calendar. The knew instantly what the real NWO game plan was. They were also immediately aware that the conference must be stopped before it gets started; that is, if the greater good for humanity is to be ensured. This march is one of many which have been conducted around the geoengineered globe over the past several years. However, this particular march is the most important one ever precisely because it will coincide with the 12 day climate conference. In this way this march will serve to greatly raise the awareness about the true intentions behind this unprecedented international meeting. This entry was posted in Agenda 2030, Agenda 21, Climate Change, Earth and the Environment, Global Governance, Paris and tagged chem trails, climate change, Climate Summit 2015, geoengineering, global warming, Paris. Bookmark the permalink.